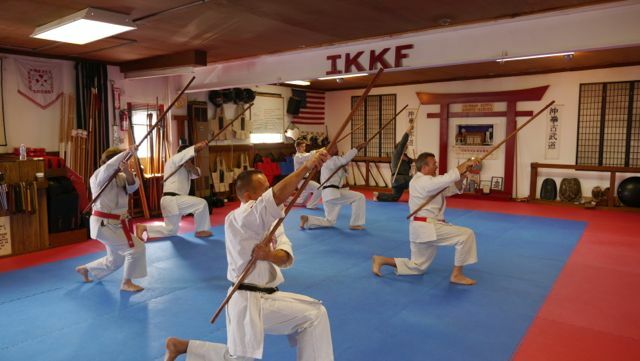 The INTERNATIONAL KARATE KOBUDO FEDERATION was pleased to hold its 29th Annual IKKF ANNUAL TRAINING, JULY 12-14, 2013. 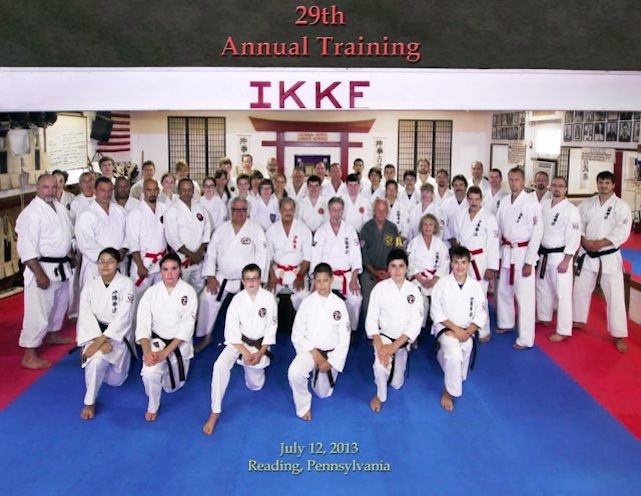 The 2013 IKKF ANNUAL TRAINING was held at THE IKKF HONBU IN READING, PA.
Due to the limited space available at the Honbu, the training was limited to 4th Kyus and above. 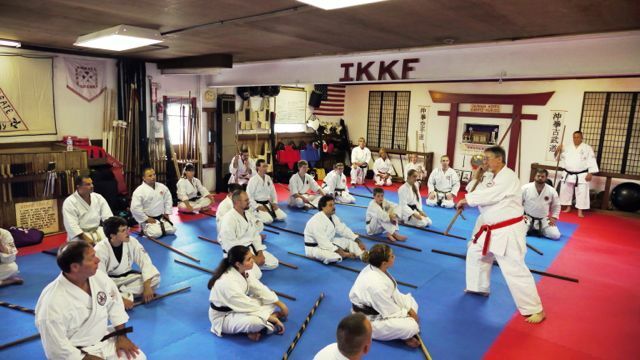 The 2013 IKKF ANNUAL TRAINING ran over 3 days covering BEGINNER, ADVANCED AND INSTRUCTOR training for KARATE, KOBUDO, APPLICATIONS THEORY, DRILLS, AND HISTORY LECTURES. 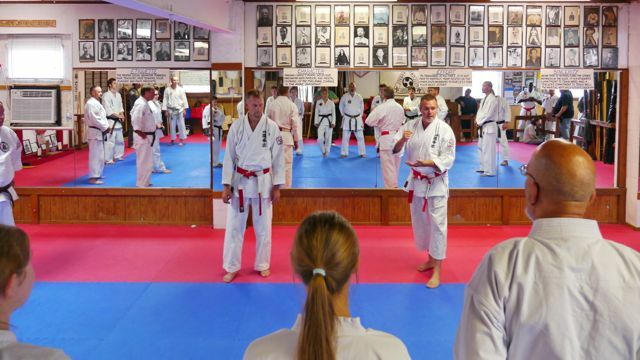 The most memorable part of the entire training was the promotion of two individuals to the title of HANSHI and ranks of 9TH DAN. 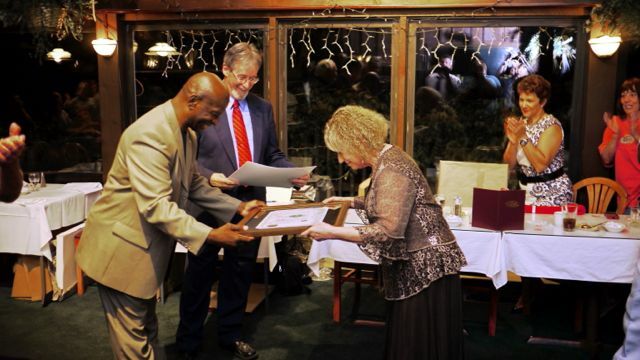 These individuals were WILLIAM HAYES and ANN-MARIE HEILMAN. 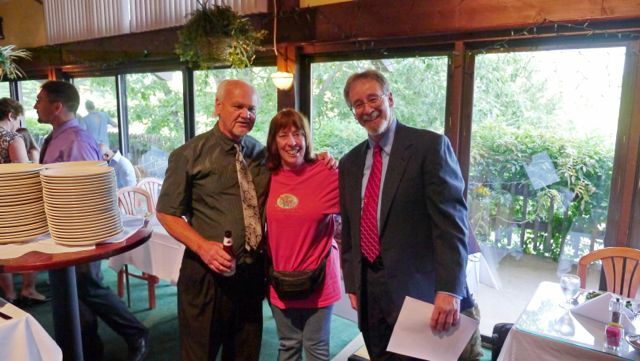 Congratulations to both of these very deserving individuals who have dedicated most of their adult lives to the study and practice of their arts. 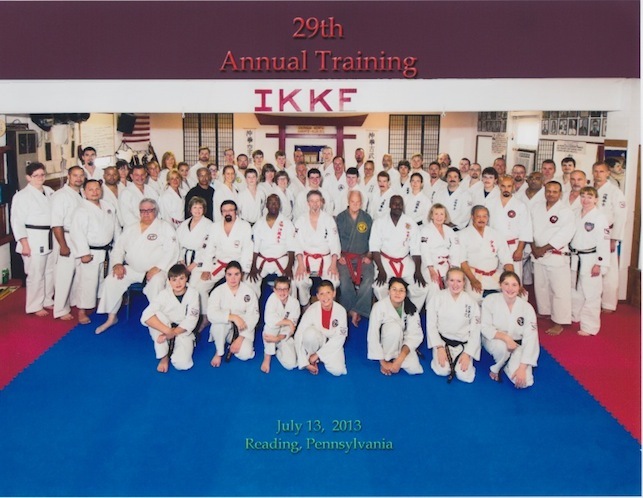 Group photo of participants at the Joint IKKF / ISMR Annual Training held on Friday in Reading, Pa at the IKKF Honbu. 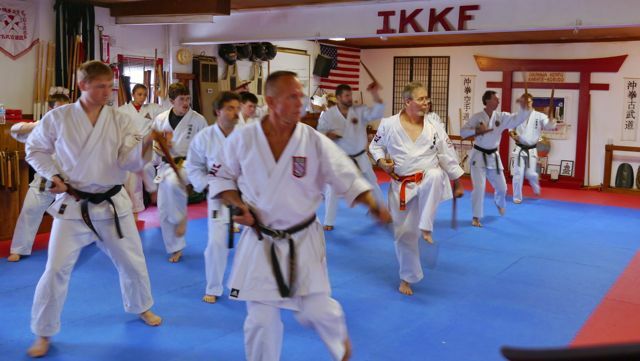 Photo of the Hanshi's participating in the 2013 Joint IKKF / ISMR Annual Training. 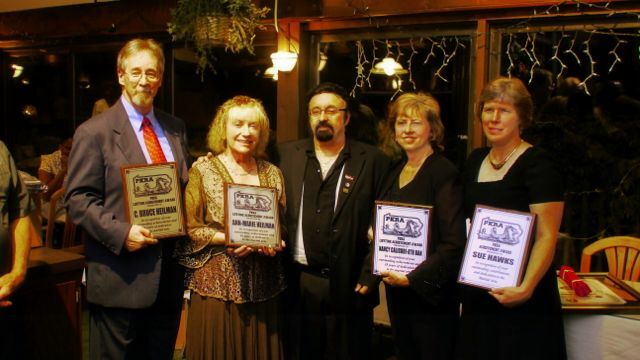 From left to right: Bill Hayes, Charles Mann, Jody Paul, Larry Isaac, C. Bruce Heilman, and Ann-Marie Heilman. 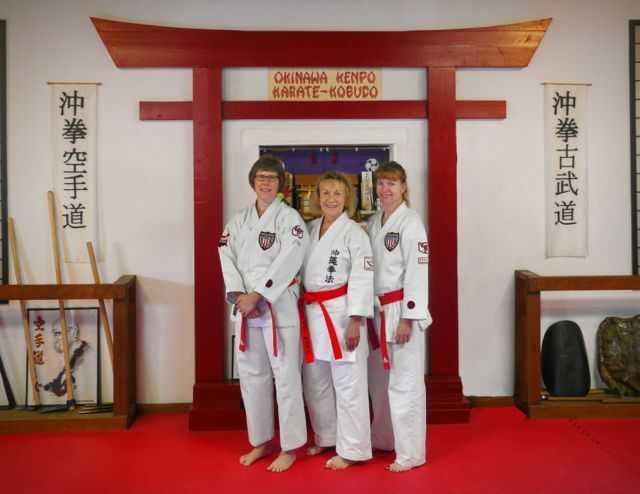 Photo of new Kyoshi's Sue Hawkes and Cassandra Shults with Hanshi Ann-Marie Heilman at 2013 Annual Training. 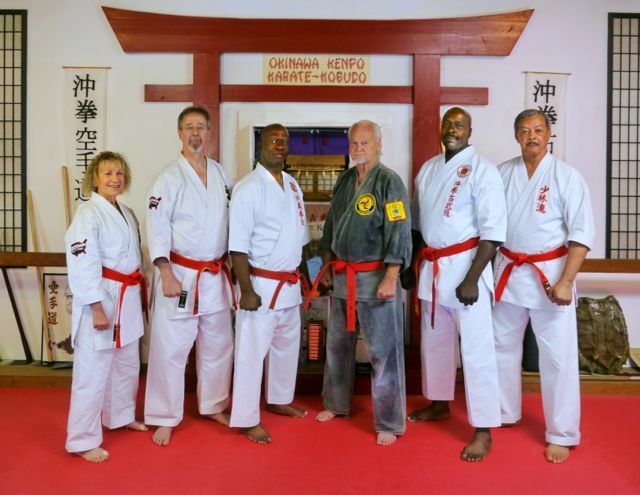 Photo of long time Okinawa Kenpo Karate & Kobudo practitioners all of who were direct students of the last Hanshi Seikichi Odo, Okinawa, Japan. 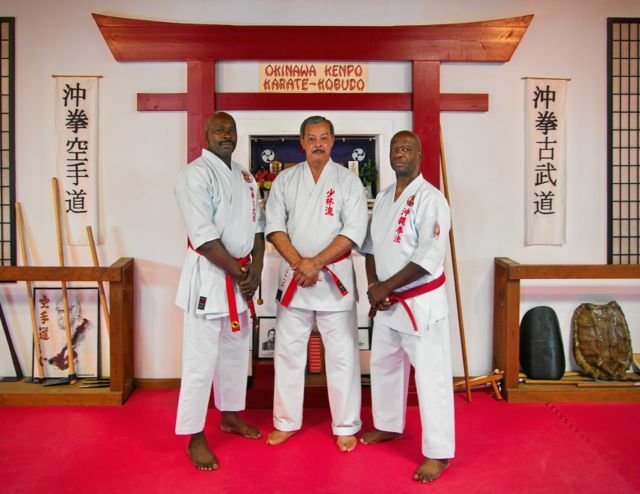 Hanshi's Mann, Hayes and Isaac taking a break from teaching duties during the multi-day training event. 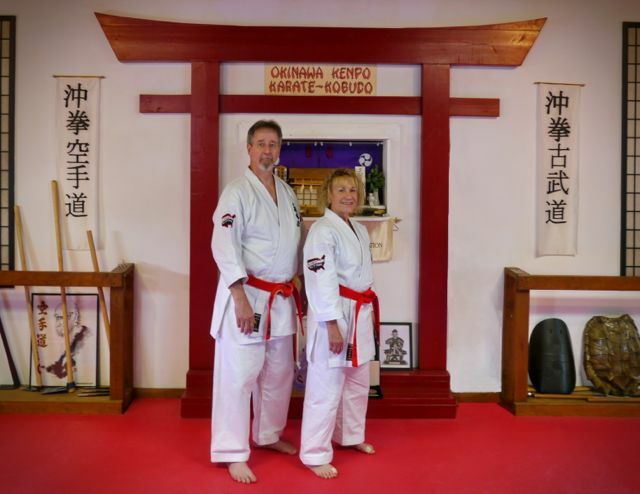 Formal photo of the Hanshi's C. Bruce and Ann-Marie Heilman, Founders of the IKKF. 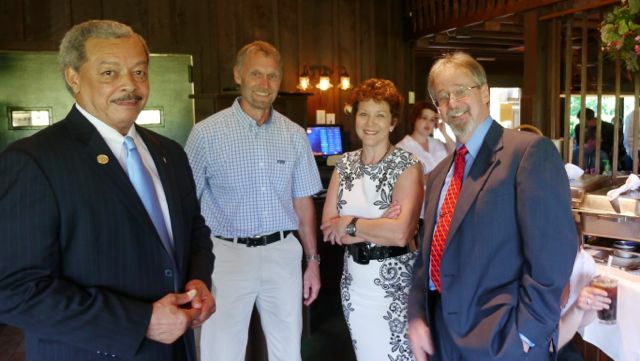 Photos of the 2013 Annual Training - another GREAT EVENT!! 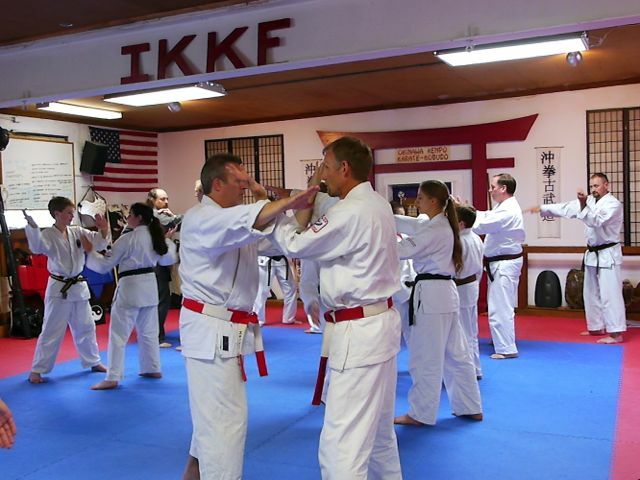 Thursday evening Open House at the IKKF Honbu - let the fun begin!!. 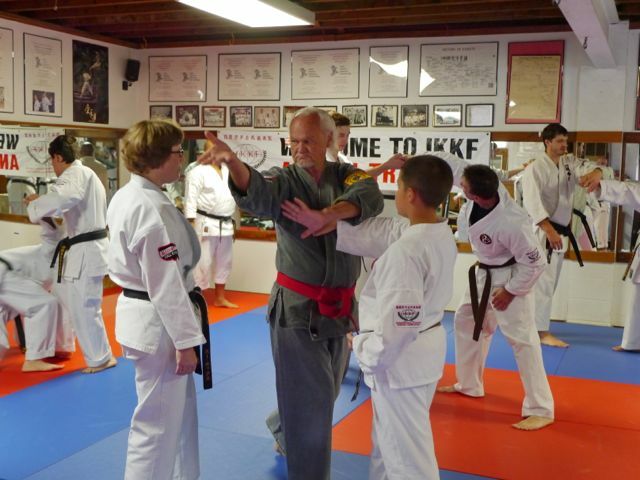 Hanshi Heilman working with student on correct sai technique. 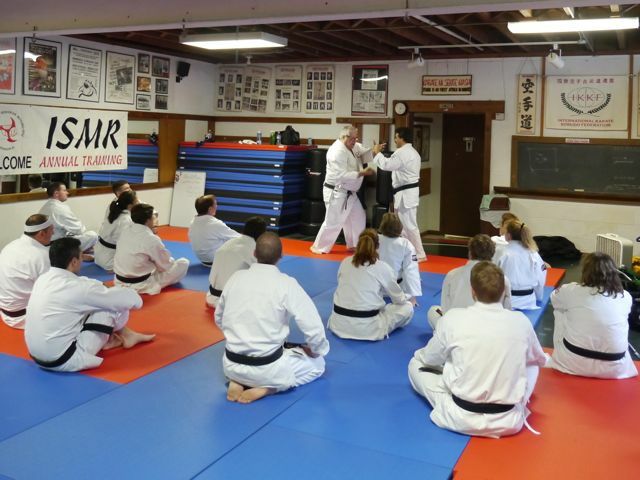 Kyoshi's Baer and Hoover preparing students for instruction on two-person drills. 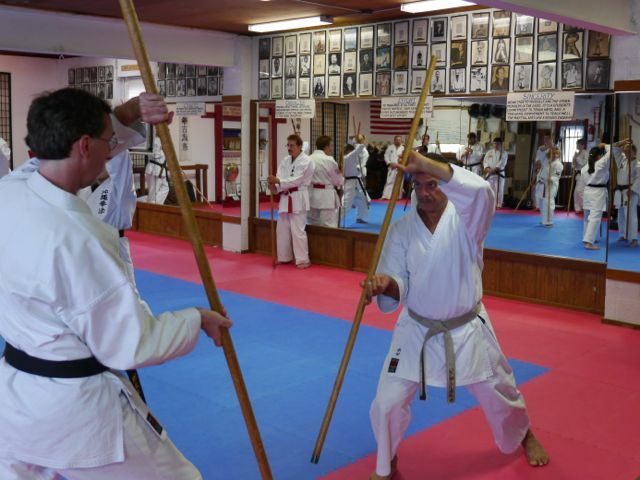 Kyoshi's Baer and Hoover working two-person drill. Participants working tunfa during training session. 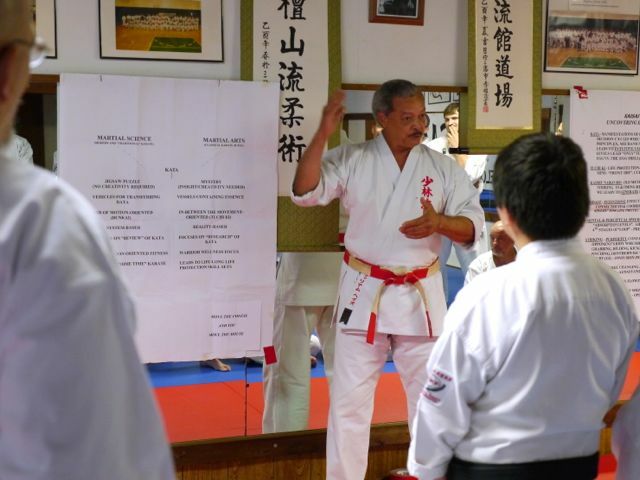 Hanshi Hayes instructing session on applications. 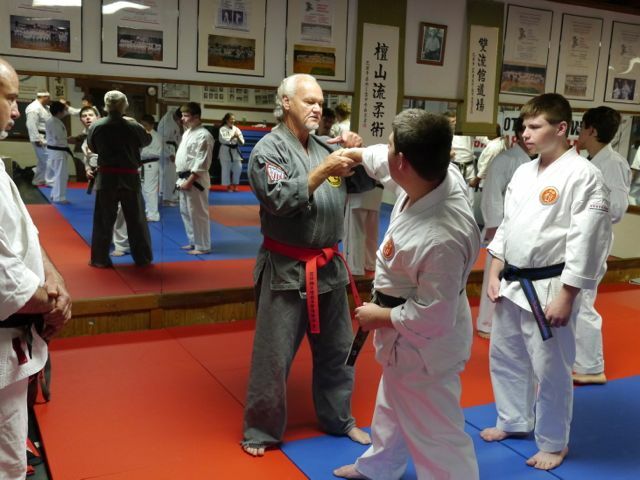 Instruction on finer points of bo work by Hanshi Heilman. 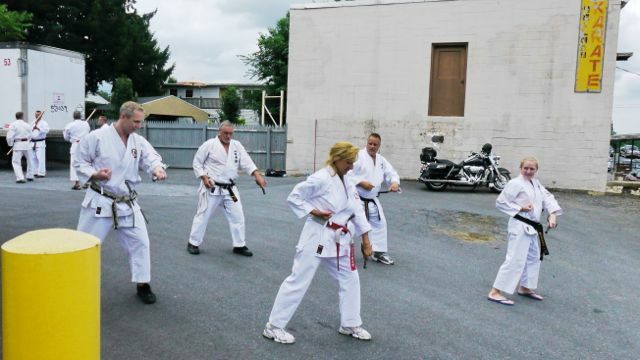 Hanshi Paul leading group through one side of two-person Odo Toide Drill. Kyoshi's Cruz and Baker working bo-bo form. 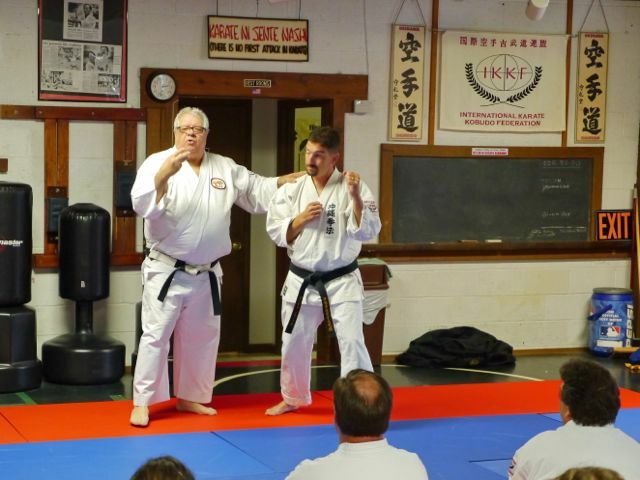 Hanshi Heilman and Kyoshi Caliguri leading session on bullying. 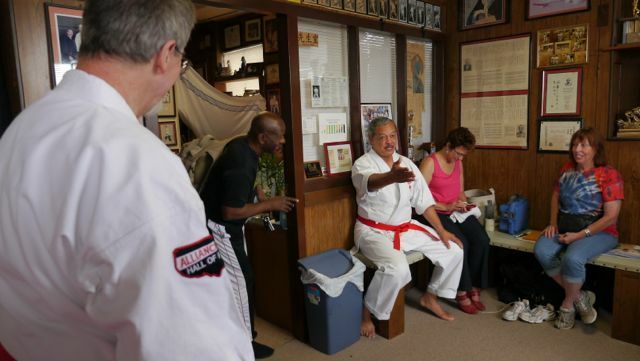 Hanshi Hayes instructing on applications. 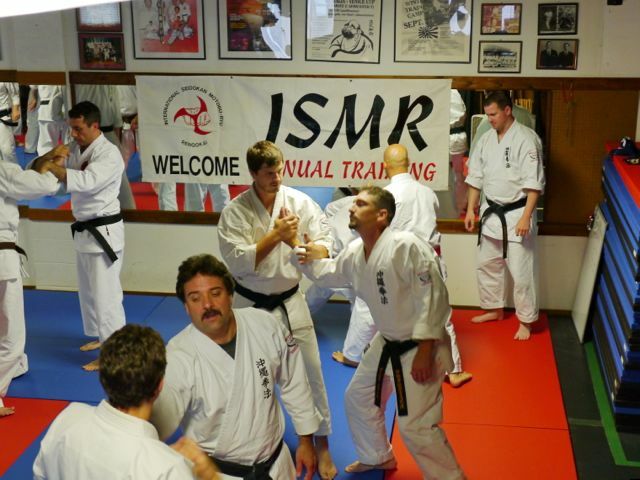 Hanshi Martin instructing session on advanced sparring concepts. 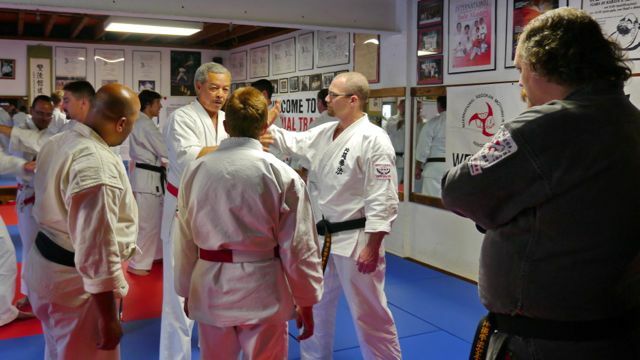 Another photo of Hanshi Martin during his sparring concepts session. 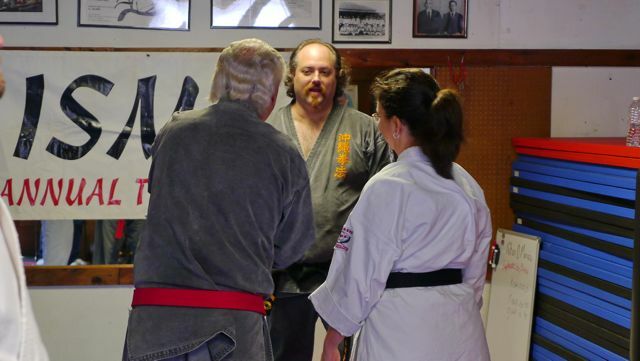 Hanshi Paul working toide with participants. 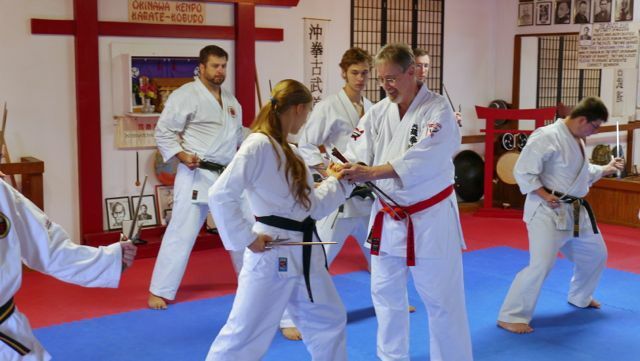 Hanshi Paul demonstrating two-person Odo Toide Drill to participants. 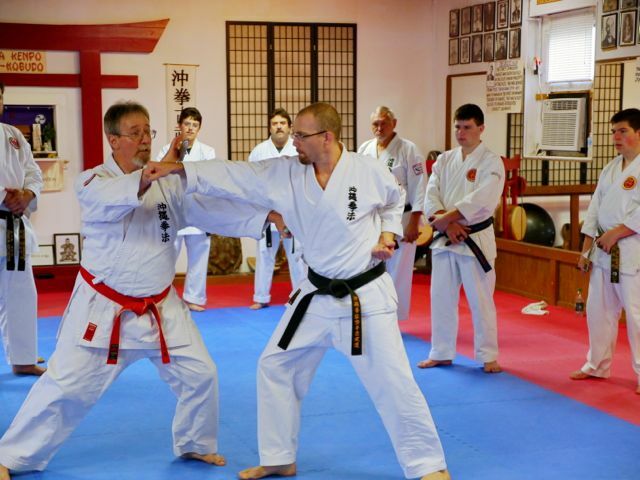 Another photos of Hanshi Heilman during session on Bo. 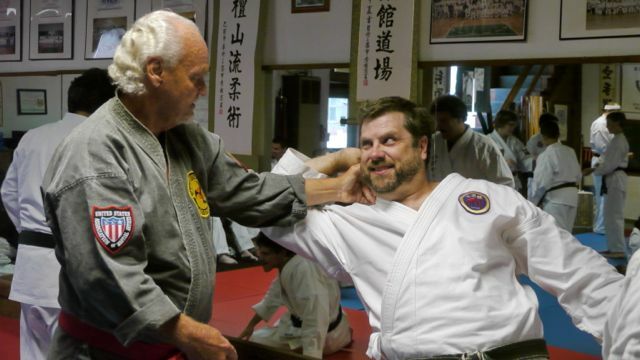 Hanshi Paul working toide technique on participant. 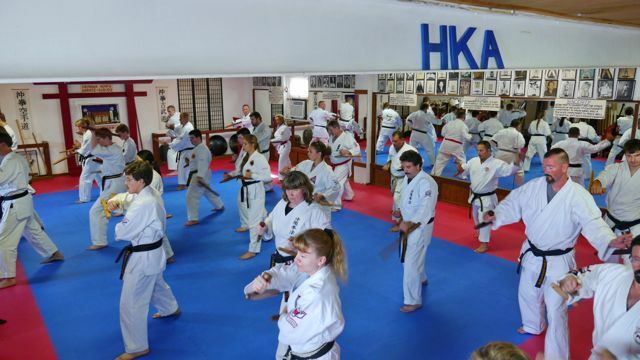 Tekkos session by Hanshi Heilman. 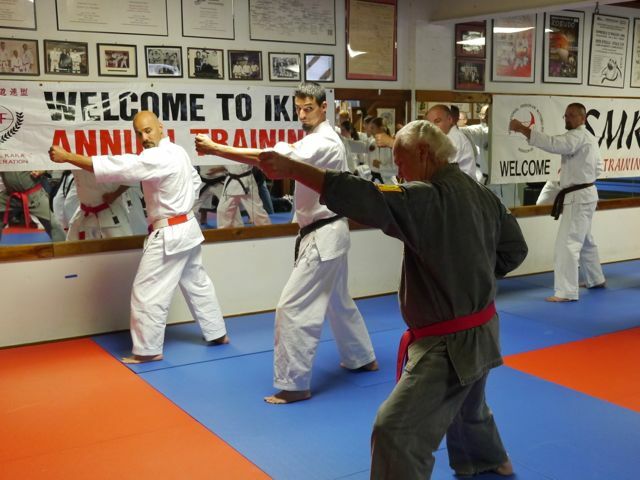 another photo of Hanshi Paul during one of his toide sessions. 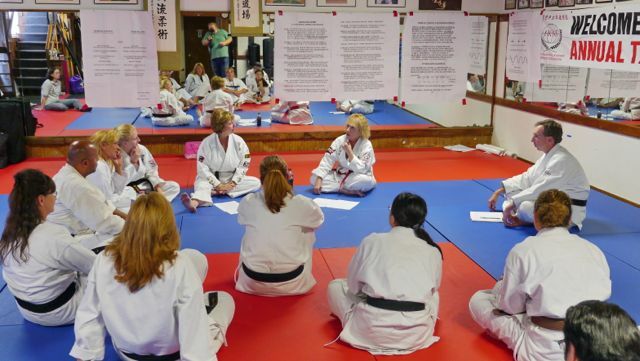 Mrs. Heilman discussion a topic during kata session. 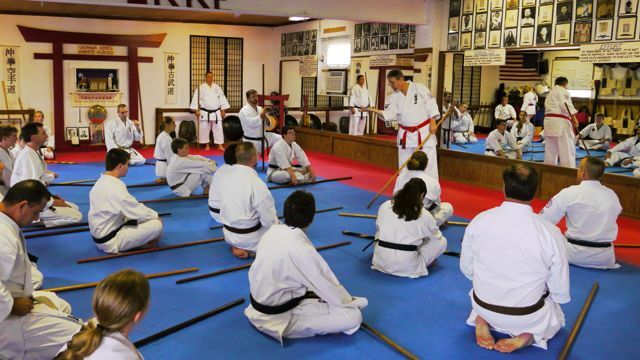 Kyoshi Baer leading session on advanced bo kata. 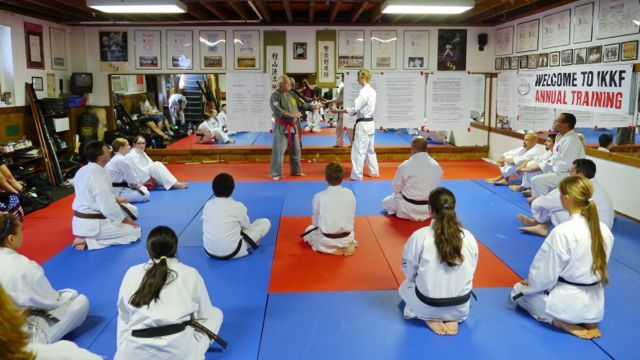 Renshi Leeper discussion topic with Hanshi Paul during training. 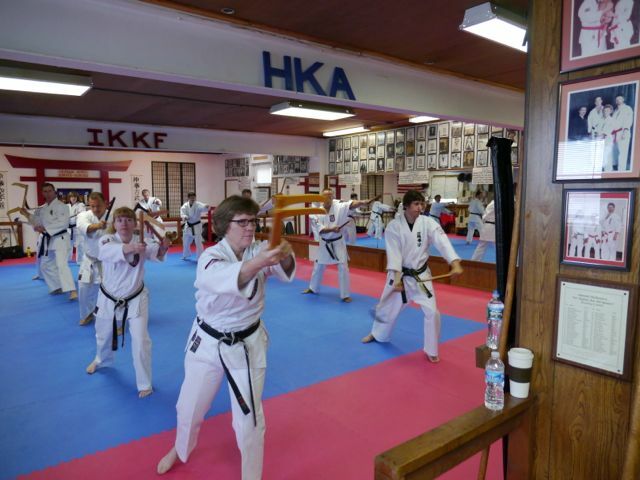 Session on tunfa by Hanshi Heilman. Participants taking a break during training. 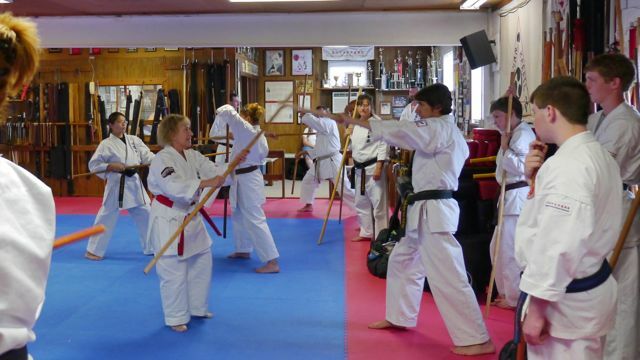 Kama training during Annual Training. 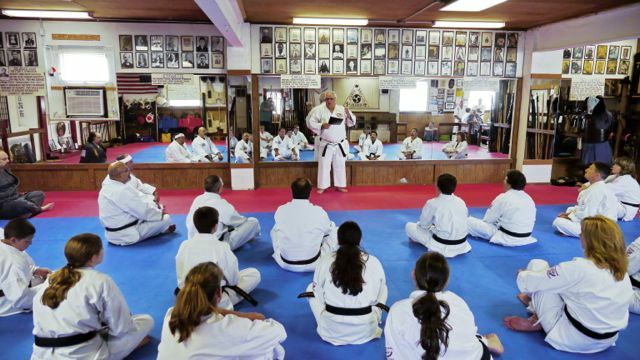 Hanshi Martin giving lecture during one of his training sessions. Outdoor training with the sai. Mrs. Heilman and Renshi Apsokardu teaching session on two-person forms. 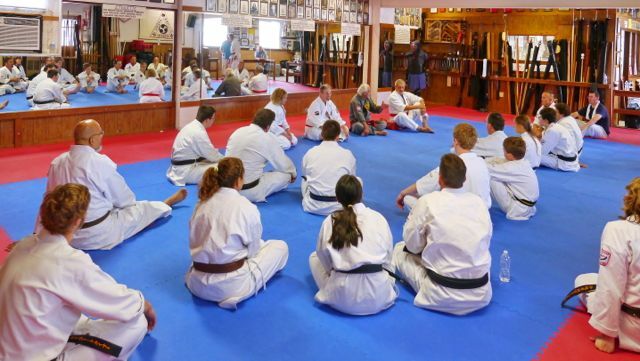 Discussion session with Hanshi's at end of training. Getting ready for the start of the Annual Banquet. 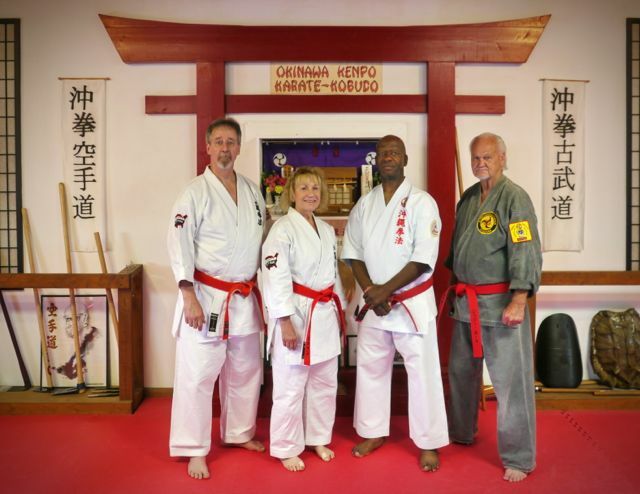 Mr. and Mrs. Hayes with Kyoshi Hoover and Hanshi Heilman. 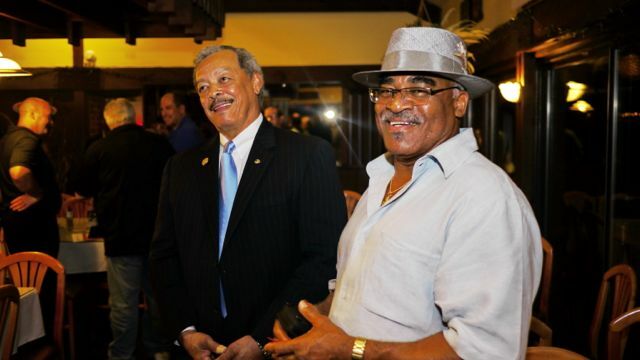 Two sharp dressed guys at the Banquet. 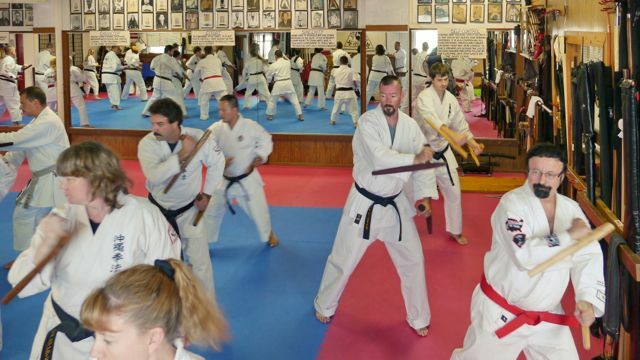 Renshi Greg Holmes displaying his promotion to Rokudan in Kobudo. 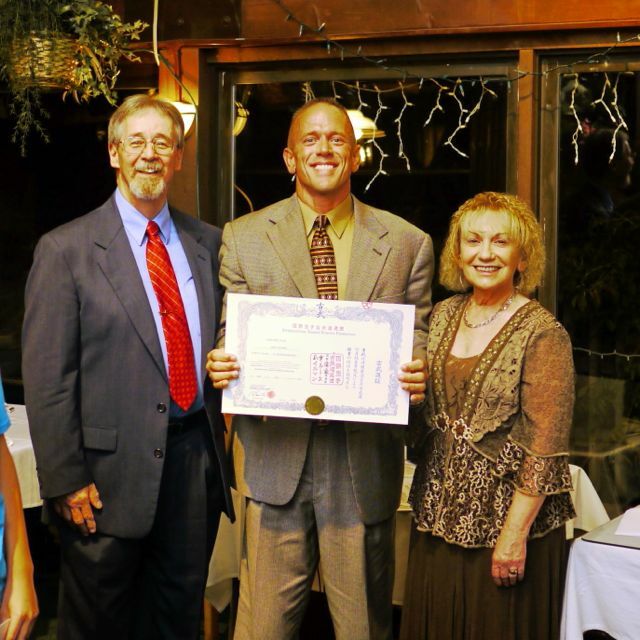 Mrs. Caliguri showing her promotion certificate for 8th Dan in Karate. 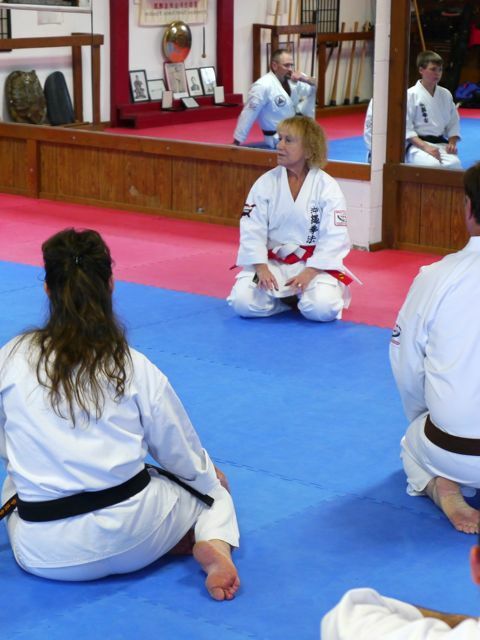 Mrs. Heilman receiving one of her promotion certificated for her promotion to Hanshi, 9th Dan in Karate and Kobudo. 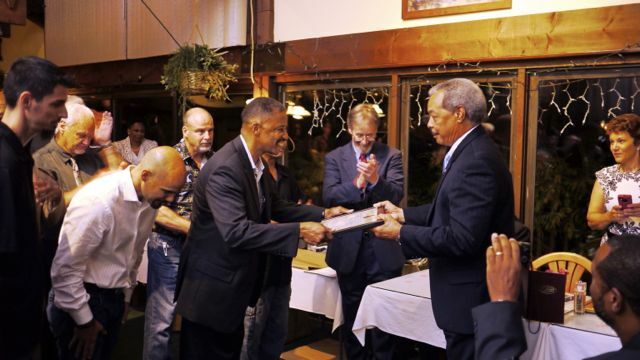 PKRA Awards presented by Hanshi Caliguri at the Annual Banquet. 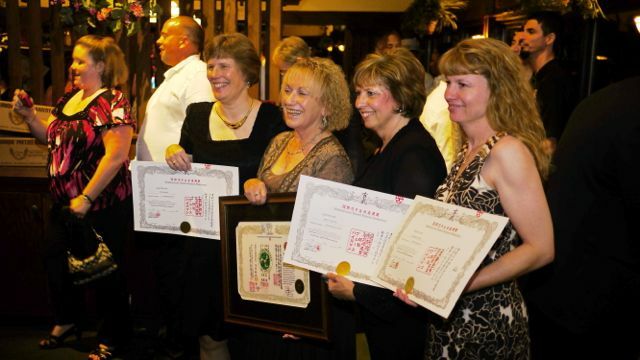 Group photo of the "IKKF Ladies" who received their promotions at the Banquet. 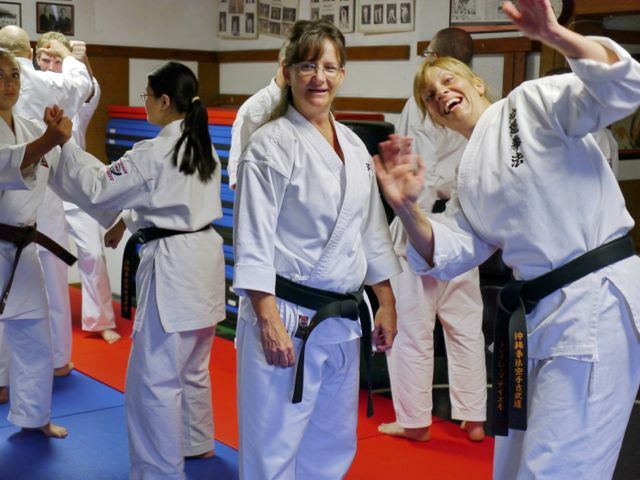 From left to right - Mrs. Hawkes, Kyoshi 7th Dan Karate; Mrs. Heilman, Hanshi, 9th Dan Karate & Kobudo; Mrs. Caliguri, 8th Dan Karate; Mrs. Shults, Kyoshi 7th Dan Karate. 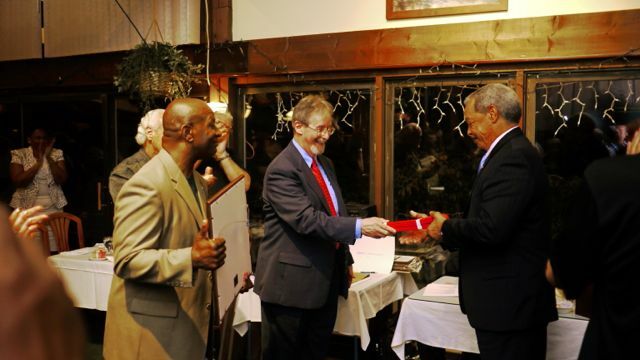 Bill Hayes receiving his red obi during promotion ceremony at the Banquet. 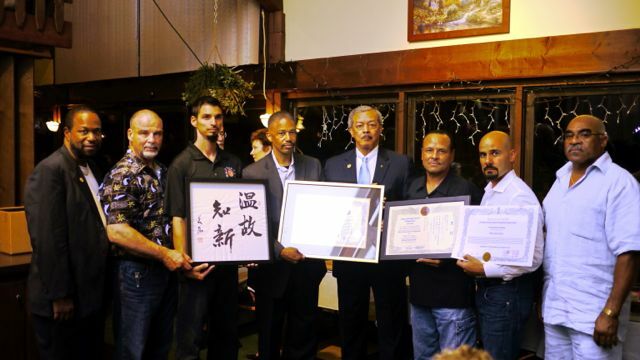 Newly promoted Hanshi Hayes with his senior students displaying his various promotion / recognition certificates. 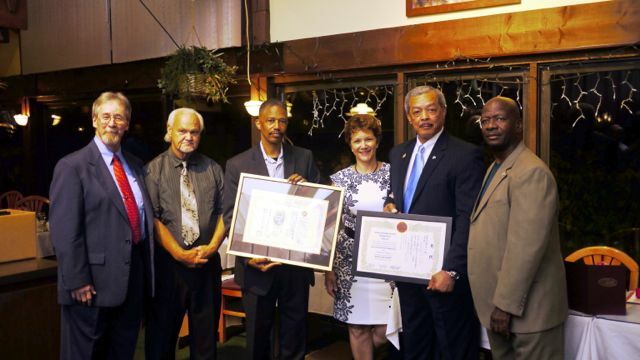 Group photo of Hanshi Heilman, Paul and Isaac who recognized promotion of Mr. Hayes to Hanshi. 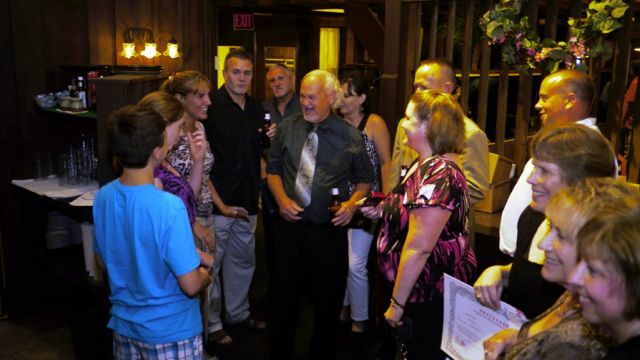 Party time begins at the end of the Banquet - another GREAT TIME for all! !.